Even though I didn’t go to the All Candy Expo, I’m still reaping the benefits. Robby has been kind enough to share his stash with me and now I get to share it with you. I love chocolate – like any self-respecting Candy Addict I consider it to be one of the major food groups. So imagine my delight upon hearing about the new Snickers fudge bar. 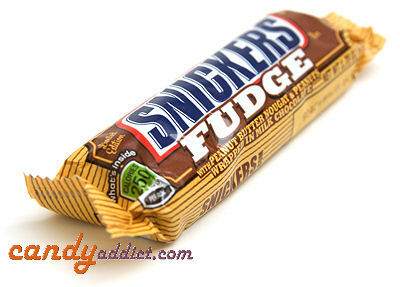 I love Snickers, I love fudge, and putting them together? Wahoo! My tummy did a little happy dance at just the thought of it… and I gotta tell you, the reality is as good as I’d hoped. What they’ve done is to replace the regular caramel with fudge and the regular nougat with peanut butter nougat. I was a little worried that would make the Snickers too sweet, but my fears were without basis. 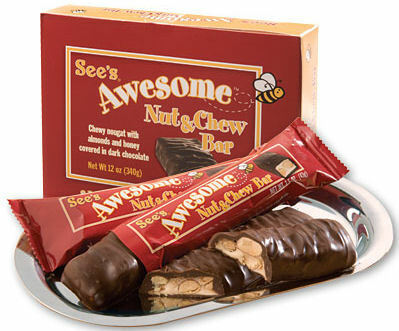 When I bit into this, I tasted sweet creamy chocolate followed immediately by a really strong peanut flavor. The peanuts temper the sweetness and both blend with and provide a counterpoint to the fudge. And the fudge, it makes the Snickers even more creamy than usual. So I got the creaminess of the chocolate, fudge, and peanut butter nougat mixed with the crunch from the peanuts for a really cool texture, along with the blended peanut butter/fudge/chocolate flavors – all smushed into one delectable bar. I loved it! If you’re a Snickers fan, or you like the peanut butter and chocolate flavor combo, you’ve got to try these! Keep an eye out for them, because they’ll be coming soon (probably around August). Brachâ€™s is probably most well known for their caramels and candy corn, but they make a vast array of other products. Like Russell Stover and Palmer, Brachâ€™s is a candy company that exists outside of the big three, but with a pretty ubiquitous presence in the market. Because most Brachâ€™s candy is sold as bulk mix-and-match penny candy or in discount packs, I never really bought them as a kid, thinking they were inherently inferior (I always bought the candy with the prettiest and/or shiniest wrappers). But after falling in love with their caramel apple candy corn, I viewed this facet of the candy industry with a refreshed perception and was ready to sample a variety of their products. Their website lists 109 different types of candy they manufacture, so it was difficult choosing what to review. Because I was limited in my selections, I chose to forgo eating some of their better known products, such as their bridge mix, so that I could review a variety of products that differentiated themselves from the staple chocolate-covered raisin. All these were purchased at my local H.E.B. The Mars Bar is the candy ship that launched an empire. Though not the first candy bar, it was the first of its kind in the U.K.. In 1932 Forrest Mars decided to introduce his own version of the popular American Milky Way bar to those east of the Atlantic. It seems odd that the Brits needed a hand from Americans when it came to chocolate, but at the time of development, most chocolate in Britain only manifested itself in solid blocks while the Americans were playing around with fillings, including nougat and caramel, which are the two components that are embedded beneath the milk chocolate coat of the Mars Bar.